I have been asked to elaborate on my understanding of the SAMR model, a model written about extensively by Dr. Ruben Puentedura. This model suggests a structure for the design of embedded technology use in the classroom to have a significant impact on student outcomes. My feeling is this model supports teachers as they design, develop, and integrate digital learning experiences that utilize technology to transform learning experiences. Along the continuum, the student engagement becomes more of the focus and students are then able to advance their own learning in a transformational manner. 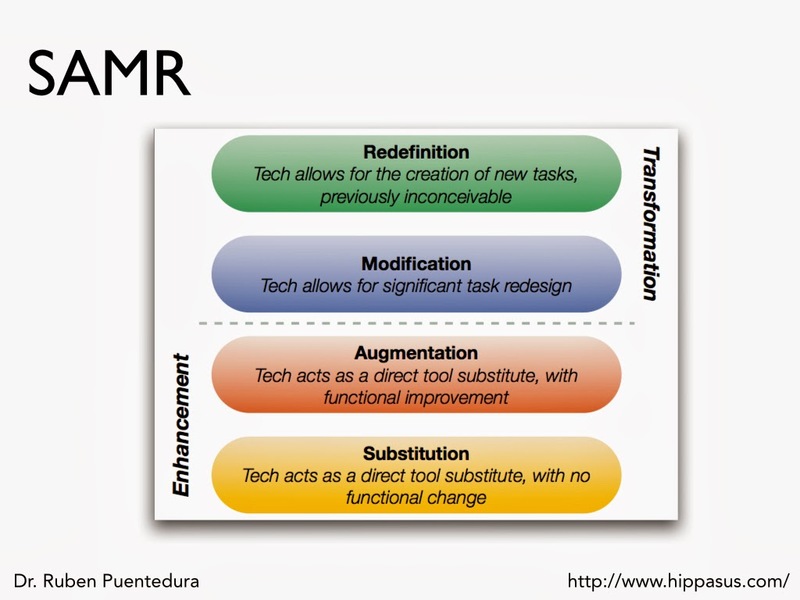 Puentedura's visual of the SAMR model is self-explanatory, as seen below. I decided to take the typical classroom process of note taking to demonstrate my thoughts for how the SAMR model might look in a classroom. Note taking is traditionally done with paper and pen/pencil. 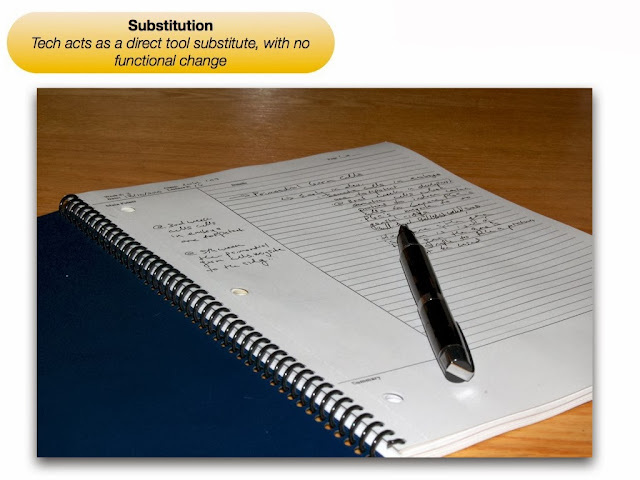 At the substitution level, you first have to think about what will be gained by the use of technology for the task. You want to make sure you are not advocating technology use just for technology's sake. In the case of note taking, however, the benefit of having notes in a digital format for ease of sharing and uploading, and providing access to them anywhere, any time, is a useful substitution activity. 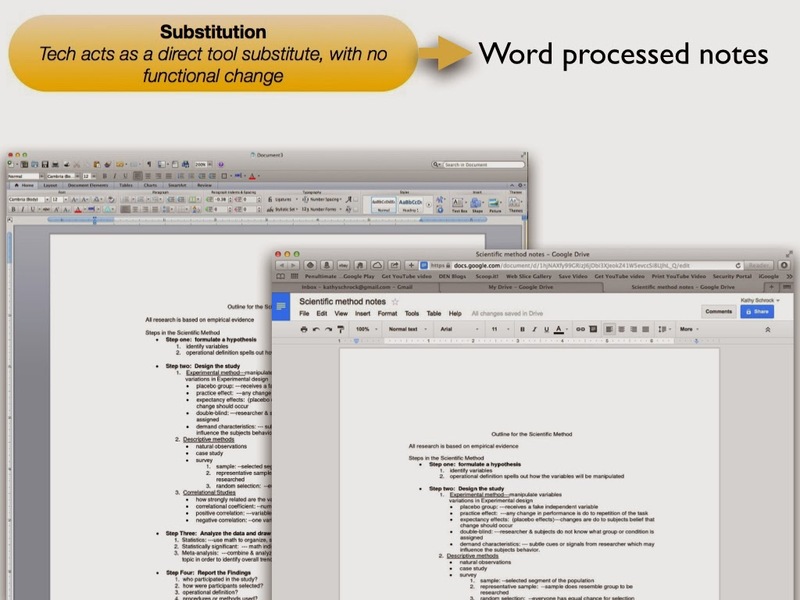 At this level, the technology substitution, with no real change in student engagement, would be the use of a stand-alone or cloud-based word processing program. 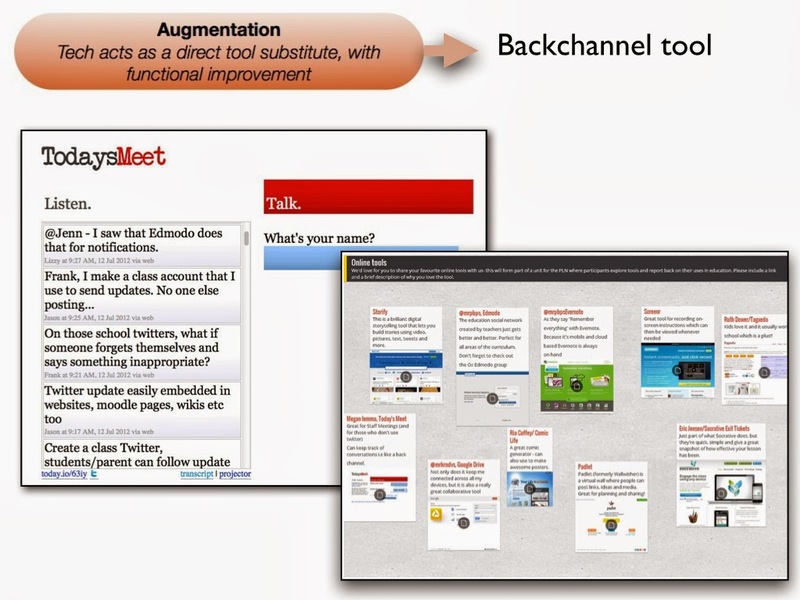 At the augmentation level, there again is a direct tool substitute, but there is some improvement in student outcomes. At this level, one of the benefits is teachers can receive almost immediate feedback on student level of understanding of material and students can also learn from others. 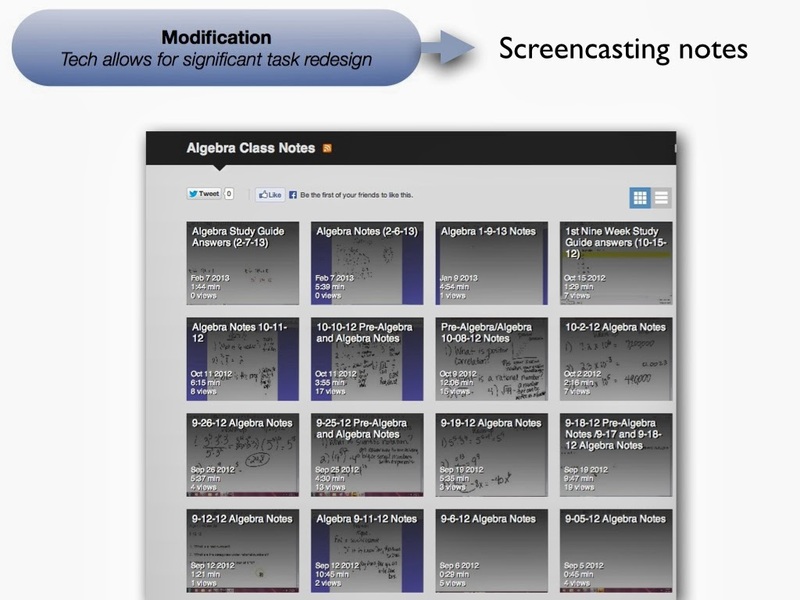 One way this can occur is by the use of a backchannel tool (such as Today's Meet or Padlet) for whole-class note taking. The augmentation level starts to move along the teacher/student-centric continuum. The impact of this immediate feedback and collaboration is that students should begin to become more engaged in the learning process. Modification allows for a change in the task redesign. Students can be asked to take notes using a screencasting tool and then later go back and add the audio component and post these online for their peers and anyone else who wants to see them. Because they are working for an public audience with this task, each student has a personal stake in their note taking. With redefinition, the emphasis is on student-centered learning. The student learns new skills and concepts as they complete the task. Sketchnoting, or visual note taking, is a way for students to practice listening as well as planning an organizational strategy for taking notes. 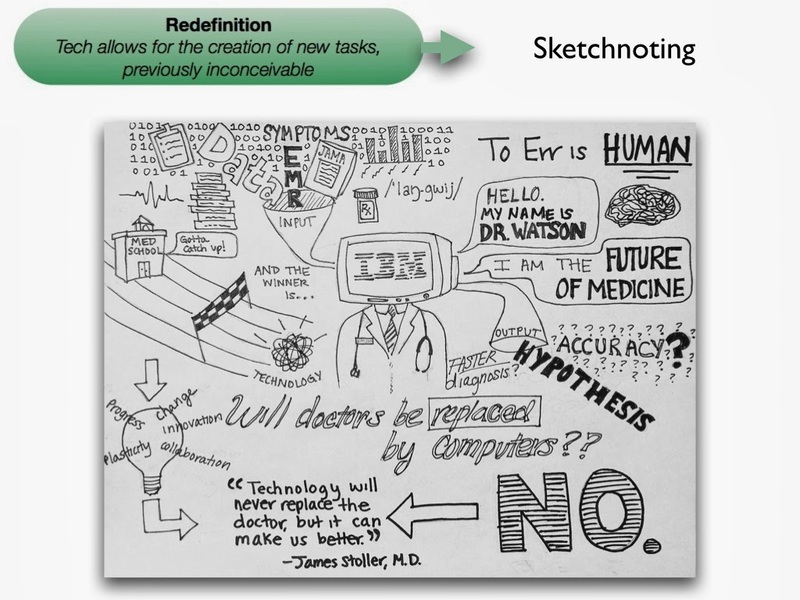 There are drawing and note-taking apps for all platforms available for sketchnoting. (A lot more about sketchnoting can be found here.) 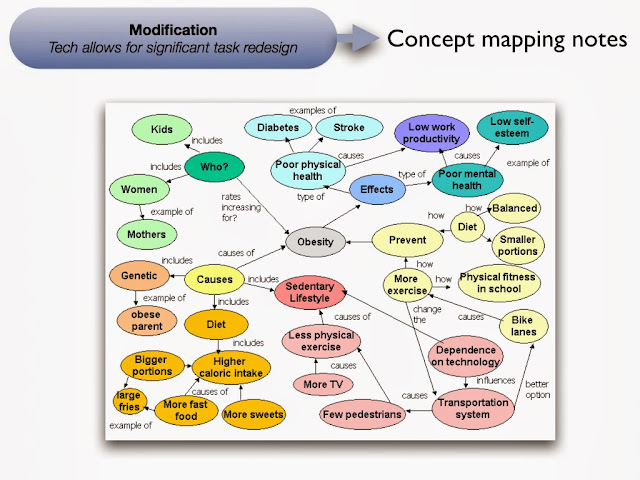 A redefined task would be for students to sketchnote, share online, and provide answers to questions about the content included in the public venue. 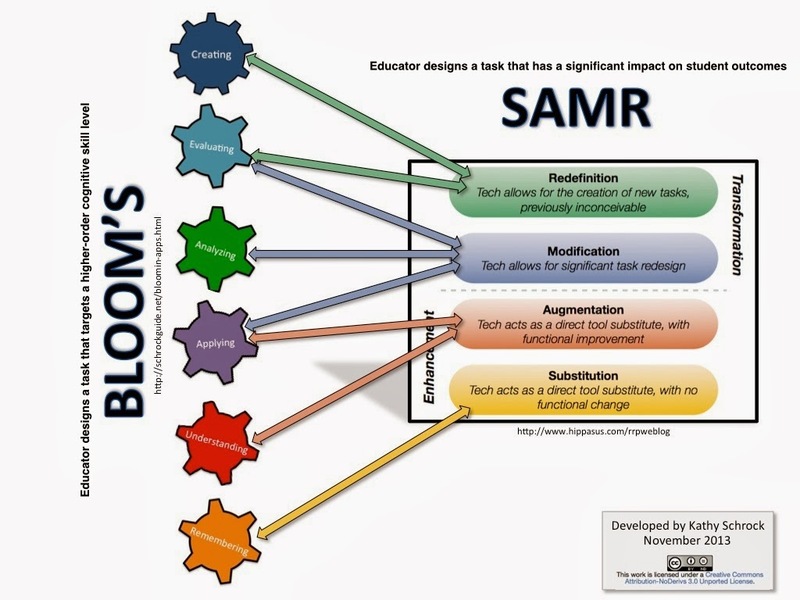 Below is a visual of my initial thoughts on the relationship between Bloom’s and the SAMR model. I feel teachers need to both create tasks that target the higher-order cognitive skills (Bloom's) as well as design tasks that have a significant impact on student outcomes (SAMR). It's as simple as that. Educators will argue that they have seen redefinition tasks that only target the remembering level or have a creative assessment that is only at the augmentation level. Of course that is true, but I believe we should be planning for technology tasks, activities, and assessments that include both the higher levels of Bloom's Revised Taxonomy and the transformation area of SAMR model. I have created a page of SAMR resources if you want to learn more and come to your own conclusions about how it might be implemented in your classroom. This post originally appeared in September of 2013 on my Discovery Educator Network blog, Kathy's Katch, where I pen a monthly blog post. Please take a look at it when you get a a chance. The new posts go up the first day of the month! I have finally had time to work with iMovie movie trailers on the iPad, and it is so much fun! A movie trailer is a perfect summarizing activity. It can also act as a "teaser" as an introduction to a presentation or student paper. A movie trailer can readily showcase the acquisition of knowledge of a lesson or unit. A movie trailer includes many of the literacy areas. There is a component of information literacy as students search for and gather assets to include in the trailer. There are reading and writing skills (traditional literacy) as students write out their ideas and scripts. There are elements of media literacy as students identify their audience, use words to persuade viewers, and maybe transfer another mode of publishing (like a research paper) into a video. Visual literacy comes into play with the choice of colors and font. The movie trailer component of the iMovie app for the iPad includes several themes to pick from. The transitions and animations are already built-in, but students can do some editing of these themes to showcase their work in a different way. The first step in making an iMovie movie trailer is taking a look at the script and storyboard pages. It is a good idea for students to spend some time thinking about the theme of the trailer they want to use and start gathering the pictures and videos to use in the production. One great site by Timothy Jefferson includes PDFs of all of the theme scripts so students can work things out on paper first, as they are going through the development process. Here is a sample of one of the PDFs. Students can create an advertisement for a product they created in a STEM class. Movie trailers can put a new spin on the "all about me" presentation. Discovery Education Streaming, with its editable videos and hundreds of images, is a wonderful set of resources to use in iMovie movie trailers. I decided to utilize DES to make an iMovie movie trailer and only use the iPad. I logged in to Discovery Education Streaming, did three searches (tornado, storm, lightning) and limited the search to images. I added the images to My Content. When I had collected enough (with three personal ones also), I opened each one and "saved to library" which then put all the images into my Photos app Camera Roll. I picked the Scary trailer theme, entered the credits information, and added the images to the storyboard, as you see below. I adjusted some of the Ken Burns transitions to highlight the important parts of the photos. I then simply sent the completed movie trailer up to YouTube! Give iMovie movie trailers a try today!